There's an apocryphal story that still occasionally surfaces about how Albert Einstein flunked math in the fourth grade. That's not true. But he did occasionally need help with his math. One time, famously, from his own assistant. The story of Einstein's search for Avogadro's Number has become famous over the years. Supposedly it proves that Einstein wasn't very good at math. That's not true. Einstein was always very good at math. But when you're a genius as a physicist and a chemist, there's always going to be something you're not as good at. Einstein was known to ask students to check his arithmetic during lectures and one of his most famous mistakes was screwing up the math during his search for Avogadro's Number. Avogadro's Number was not named by Amedeo Avogadro, but for him. Avogadro was an 18th century chemist who noticed that if you brought one specific volume of oxygen gas together with two specific volumes of hydrogen gas, you got water, without any gas leftover. He deduced that, if you had, for example, a quart of hydrogen gas and a quart of xenon gas, both at the same temperature and pressure, you had the same number of atoms of each gas. The fact that xenon is much bigger than hydrogen doesn't matter. Avogadro made a connection between the macro world of measurable volume, and the immeasurable micro world of single atoms. When chemists wanted to make a similar connection, this time between the macro world of weight in grams and the immeasurable micro world of single atoms, they wanted to honor him. Since electrons are so insubstantial, mass is measured in protons. Scientists figured that a certain number of hydrogen atoms had to be in one gram of hydrogen. Atomic nuclei are all multiples of the weight of hydrogen - the weight of one proton. So if this number, Avogadro's Number, of hydrogen atoms produces one gram of hydrogen, the same number of helium atom produces two grams of helium, and so on. Knowing this number would allow scientists to know exactly how many atoms they were working with simply by measuring the weight of a substance. Scientists the world over tried to figure this number out. Einstein came at Avogadro's Number through a complicated route. He had spent some time looking at how individual particles "walked" through a solution, and proved that the force that made them walk was the random motion of atoms in the solution. His attempt at finding Avogadro's Number involved looking at how the particle moving through a solution affected that solution, instead of just the solutions effect on the particle. He looked at how sugar, dissolving in a solution, changed the viscosity of the solution as it dissolved. Gathering enough data on this would provide him with enough data to figure out Avogadro's Number and the diameter of the sugar particles that were dissolving. He got the sugar molecule diameter right - about one nanometer. When it came to Avogadro's Number, he got approximately 2.1 x 1023. This was not right. Because the hunt for Avogadro's Number was so widespread, it didn't take long for Einstein to realize it wasn't right. A physicist named Jean Perrin soon got a result close to the modern accepted number of 6.02 x 1023, and proved that his number was far more accurate than Einstein's. Einstein went looking for answers. Hopf looked over the equations and found, in the end, a miscalculated coefficient of friction. That was all it took. 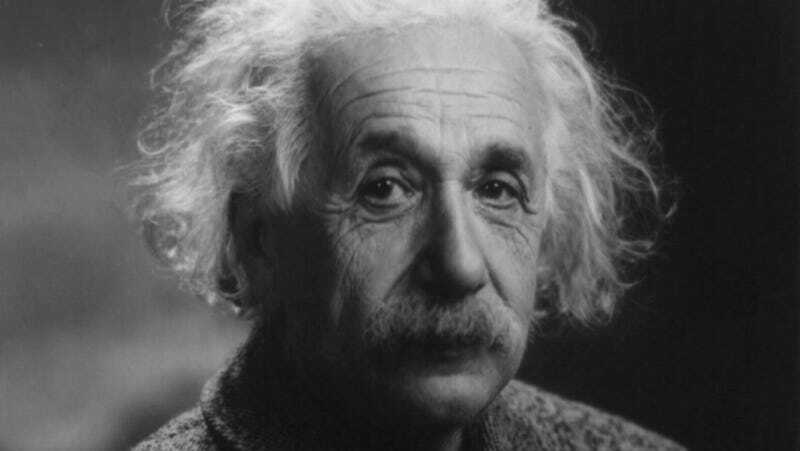 Einstein re-ran the numbers and got a respectable number of 6.56 x 1023. This fit with the current understanding of the number, and is, even to modern eyes, a good estimate for a guy measuring sugar solution viscosity. Both Einstein and Hopf fled Germany during the rise of the Nazis. Einstein went on to live a long time, working around the world on both scientific and humanitarian projects. Sadly, Hopf died of an illness just at the beginning of the second World War. Via Royal Society for Chemistry, University of the West Indies, Mathematics Genealogy Project.